Lawrence F. Grey, M.D. is a Board Certified Urologist whose whole career is devoted to vasectomy reversals. He performs vasectomy reversal surgery daily and has published the best success rates in America. He has been interviewed by CNN, 20/20, Time Magazine, The Wall Street Journal, The New York Times, The Tampa Tribune, Newsweek, Modern Maturity, The Business Journal, U.S.A. Today, and Colleagues in Urology. 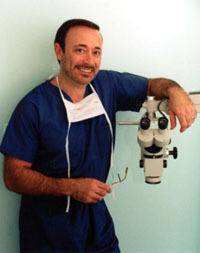 His surgical innovations have been featured medical reports on FOX, CBS, ABC, and NBC News. People come to Tampa from all over the world to have Dr. Grey do their vasectomy reversal. Dr. Grey has reconnected two thousand five hundred (2,500) vas deferens since 2002 alone! In 2004, patients from about 400 different cities worldwide traveled to Tampa, Florida to have a vasectomy reversal performed by Dr. Grey. You may click the blue buttons on the right to see country lists for 2002, 2003, and 2004. Dr. Grey conceived and developed the micro-precise technique and machined many of the instruments. His publications have been referenced in text books and medical journals throughout the world. Because the vasectomy reversal is done in Dr. Grey's center, there are no hospital or facility fees. The total fee is remarkably fair, just $6,500; or $6000. with a discount (see finances page). For a free vasectomy reversal information package, call us toll-free at 1-877-839-8878 or Contact Us. From now through January 1, all vasectomy reversals booked will be done for $5500. regardless of when the surgery is performed; a discount of $1000. Click button below for a free comprehensive info package. A portion of our revenue is donated to guide dog training for the blind. Click the image below for details.